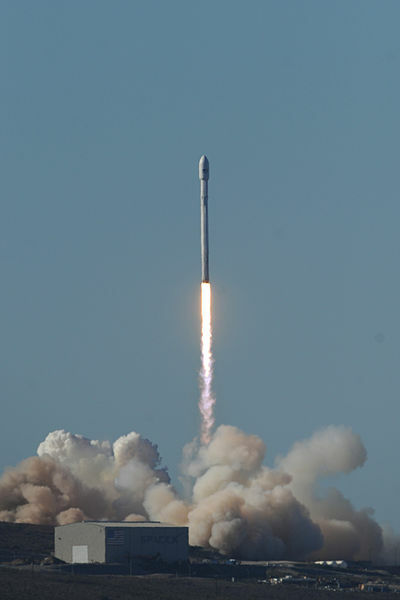 In the filing on Monday January 28, aerospace manufacturer says it is aiming for no earlier than Thursday March 7, 2019 for the launch which means the liftoff could easily get pushed to the right. The launch will take place from the iconic Launch Complex 39A at NASA’s Kennedy Space Center at Port Canaveral, which also served as the jumping-off point for Apollo moon missions, as well as space shuttle flights. The rocket will launch the 6.6-ton Arabsat 6A communications satellite for Saudi Arabia, a far more conventional payload than the Falcon Heavy carried on its first mission. That first Falcon Heavy flight which lifted off in February 2018, sent a Tesla Roadster and its mannequin driver, dubbed Starman, into orbit around the sun. The Falcon Heavy is a two-stage rocket with a reusable first stage. The first stage consists of three Falcon 9 first stages: a modified central ‘core’ and two side boosters. All three of the boosters are designed to land back on Earth and fly again. Both side boosters will come back to land at Cape Canaveral, while the central core booster will head for a drone ship far out at sea called Of Course I Still Love You. The second stage is not reusable. The Falcon Heavy is currently the most powerful rocket. The launcher is capable of carrying about 70 tons to Earth orbit, according to SpaceX.